LSI - LiDAR Services International Inc.
LSI performed a survey of multiple sites across central and southern Saskatchewan totaling over 2200 sq km for hydrologic studies. LiDAR digital elevation models, contours and high-resolution orthorectified imagery were required by the client for the management of federally-owned dams and irrigation projects in the region. Hydraulic modeling of floodplains and water courses was performed using the collected data in order to assess environmental risks and emergency preparedness at each site. Since 2008, LSI has surveyed thousands of sq km for oil sands related projects in the Fort McMurray region of Alberta for numerous clients. The topographic and vegetation information obtained from the LiDAR surveys has been used for various purposes, including tailings site reclamation projects, seismic survey design and land management. LSI surveyed a 500 km by 1 km winter road corridor from Wrigley to Norman Wells, Northwest Territories with its Cessna 185 mounted MATRIX LiDAR system. Deliverables included LiDAR DTM points with 0.8 metre spacing, bare-earth and full-feature greyscale hillshade models and 1-metre contours with full water-body vectorization. The delivered data were used by the client for engineering design of an all-season highway linking these remote northern communities. LSI was contracted to perform a LiDAR survey of a 225 sq km mining concession in northeast Nicaragua for a large gold mining company. The area consisted of extremely dense tropical forest with very limited ground access. The airborne LiDAR data collection was carried out over a 4-day period and the data processing was completed at the LSI office in Calgary. The DEM and contours derived from the LiDAR data were used by the client to identify protruding geological structures (rock outcroppings, etc. ), select and plan new drill sites and design access roads. Certain areas of interests were identified from the bare earth terrain models, prompting additional and ongoing drilling exploration within the concession. 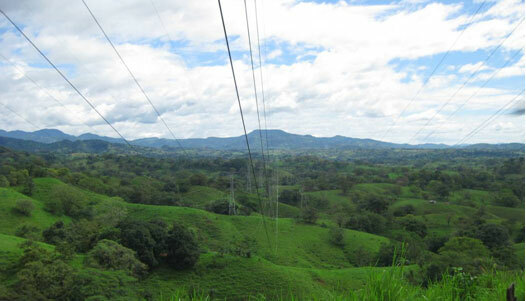 LSI surveyed 870 km of electrical transmission lines across the Republic of Panama for thermal rating analysis and corridor management. The MATRIX LiDAR system was mounted on a locally-owned and operated Bell 206B Jet Ranger helicopter. LiDAR point clouds, downward imagery, oblique tower photos and forward video were collected for a width of 100 metres on either side of the transmission centerlines. The survey covered mountainous and densely vegetated terrain and required the establishment of an extensive GPS ground control network. The delivered products were used in the thermal rating analysis of the surveyed transmission lines to determine the maximum operating temperature and identify existing or potential clearance violations. LSI provided bare earth and full feature DEM and high resolution orthophotos for a proposed mine site, plant site, and connecting pipeline route approximately 300 sq km to support the planning and development of a nickel mine in Madagascar. The project terrain varied from remote mountainous jungle to coastal flood plain. LSI established a GPS control network in order to provide an accurate DEM and orthophotography for the entire project area. The rugged terrain, dense vegetation, and weather patterns presented a unique challenge to the LSI survey team. Contours were also delivered for the required project areas. The data is being used to locate sites for facilities, select pipeline routes, and minimize and evaluate environmental impacts.